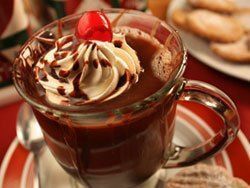 Celebrate National Black Forest Cake Day with this delicious Black Forest Coffee!! Combine Six oz coffee warm, Two tb chocolate syrup, and cherry juice in a cup; mix well. Top with whippedcream, chocolate shavings and cherry. and ready to enjoyed.